If you’re in the area, I’ll be speaking on the 15th March at Not So Popular’s night #Peaks – a culture club of art, performance and DJ vibes. exploring the role of art & graphics on the urban landscape, alongside fellow frenchie Caroline Derveaux who is exhibiting her work, and finishing with an acid house DJ set. Street Messages & Creative Placemaking project featured on the Development Planning Unit Blog, UCL. The Street Messages & Creative Place Making project began in July with the aim of going to the encounter of street art within the street. Supported by the Young Urbanists Small Grants Scheme from the Academy of Urbanism, it sought to encourage thinking creatively about our cities, urban planning and place making. Over the last few months, a series of walks have been conducted across different neighbourhoods in London with Young Urbanists, academics, friends, strangers, communities, artists. This was documented both through photography, mapping and short films, as well as written accounts through the creative placemaker blog. As the closing of the project, on Tuesday 20th October Claire Tunnacliffe will share her thoughts and experiences of the project, as well as show a short film screening, panel discussion, Q&A and interactive exhibition. This is kindly hosted by Space Syntax at their studios in Clerkenwell. Expect interactivity, drink & nibbles! 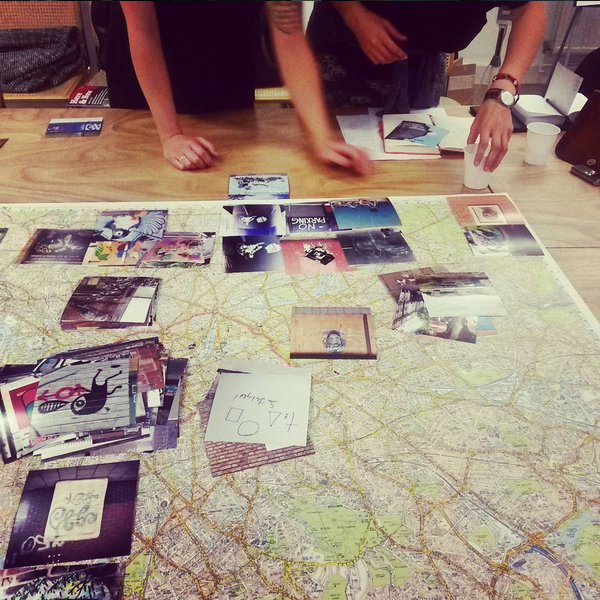 The themes that emerge from the images collected during the walks. I was fortunate enough to have a really diverse group of people wanting to attend the workshop and help tease out some of the questions I had developed over the course of the summer. 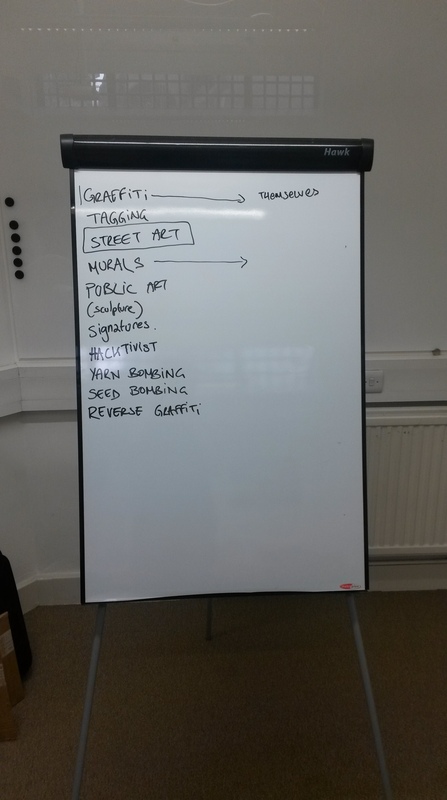 The first part of the workshop was to understand what we mean by street art/street messages, our attitudes towards it and the variations that fall under it. It was worth deconstructing this, as I have myself have been interchangeably using the terminology between street art and street messages (and which I will continue to do so in this blog…). So much is bulked under what is now commonly called street art, but there are many ways of going into public spaces and appropriating them – from needing to write our name on the wall, to writing poetry, to working with a community to paint a mural. But also in the types of mediums used – not just pen or spray can, but performance, reverse graffiti (cleaning off walls to leave an image rather than layering on), yarn or seed bombing, hactivism, etc. This first exercise raised questions of intent, the role of the artist and the legacy of a piece, and the importance of ephemerality. It asked a critical question – how do we talk about creative place making in this sense when we are talking about someone else’s imprint and what they’ve left as a legacy in those spaces? One participant also commented that art in these spaces, as un-commissioned, or at least demonetized commissioned pieces, were part of the last democratic art worlds. Initially, two categories were emerging: street art/messages that were for the self, the individual need & desire, and the street art/messages for the community. But a third was also becoming apparent, street art/messages initially for the self, but which connected to others through their capacity to connect to people’s ‘selves’ – engaging recognition, empathy and commonality. Creative: chance; making; authenticity; inspiration; intention; imaginative; collective; fixed; individual; active, process; utopian; talent; production; modification; ephemeral; tangible; collaborative; original; flow; innovative; process. Place: purpose; communities; conflict; unique; identity; iconography; dwell; inhabit; production; memory; environment; habitat; relation; boundaries; static; use; regulation; ownership; attachment; homotopia; heterotopia; sensorial; travelling; space; positioning; location; change; transient; fluid; history. Making: ownership; defining; redefining; building; conscious; change; active; curating; doing; intention; production; transformation; ongoing. In combining words from each, we attempted as a group to find meaning between these new combinations; i.e; chance communities building, imaginative iconography curating, active environment transformation, etc. Discussion lead to thinking about what constitute spaces or non-spaces (is a place ever a non-place, as outside of human activity it will always be a place for someone), as well as who is the maker in creative place making – is it the artists alone, or can the viewer become creative place maker by engaging with a piece and either confirming or not their position through the very act of viewing? The exercise placed words against others which perhaps had no meaning alone, but together created an entirely new meaning. Creative place making, is not a process with an end point, but the constant transforming, defining and re-defining, and curating of public spaces.Creative place making is transient. Frictions became apparent between words like creative and making, as they are active, made through action, but also insinuate ownership by an individual or group. Place on the other hand encompasses everything in an area, exterior to the self. Against the System/Critique of Technology. But – How does contextual knowledge/explanation of their intent change their meaning or first impression? What is one persons art is anothers irrelevence. The exercise revealed the dangers of imposing our own meaning. By aligning the four neighbourhoods next to each other, parallel to the theme categories that emerged throughout the day, an interesting observation made by a participant was that Shoreditch didn’t ‘have’ any gentrification pieces or messages documented, but actually had a lot in terms of against the system/critique of technology. It touched on the previous weeks observations made the week before about talking in terms of a ‘post-gentrified’ space. But deconstructing that terminology would involve a whole other workshop. Shoreditch has created its identity around street art. 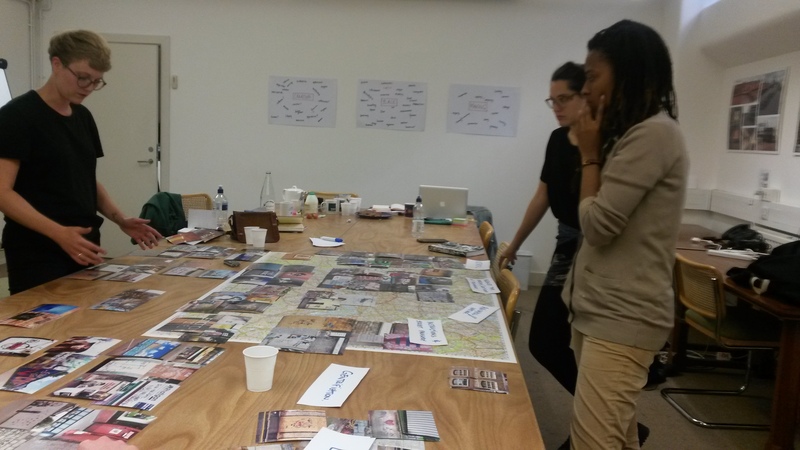 The themes pointed out by participants, showed a narrative around changing spaces, in Brockley-Brixton-Peckham & Shoreditch street art becomes embroiled on the gentrification process. Is there an idea around expectation – you go to East London and expect street art, but you go to West London, Kensington, Chelsea, and you’re surprised. Shoreditch being designated as the creative space, in terms of art, creativity, start ups or like in Brixton street art is framed, not exclusively but noticeably, as part of the save the arches campaign. In Shoreditch has it become a victim of its own branding, and can you talk about place making v. branding? Is it in fact, ‘place made’, can it continue to be creative because it’s so commercialised. Street art appropriates signs and bill boards, while advertisers co opt street art space, and it is within this constant appropriation form both that a remixing of culture occurs. Is creative place making about the individual singular piece of art, or is it the very act of people generating a dialogue thats creative through this appropriation and re-appropriation – taking back something, and imprinting on the walls. Within the cycle of capitalism, sub cultures are appropriated, especially if the sub culture is anti-ethical of what it wants to do. A capitalist system wasn’t able to repress graffiti and street art, so appropriated it, branded it as cool and monitized it. So, does street art have the capacity of creating behaviour change. The more immediate messages like breath and smile, have an immediate effect. But how much is looking at an image going to create behaviour change? Impact is nuanced. I do not think you can see a piece and be compelled for long-lasting change, but I do think there are tricklings, and it is this trickling. One participant suggested that councils and governments should go out to pick up the pulse of the place by exploring these pieces and messages. Don’t just buff it off the wall, listen. A second workshop will be scheduled to further explore the definition of creative place making against the themes. There will be a screening+talk on the 20th of October. Anna Pichugina came across the Creative Placemaker project on the Academy of Urbanism and sent this snap of Mobstr in her neighbourhood. If you wish to contribute just jump across to the Exhibition page to find out the how, what, who, where of submitting. Want to be part of the Creative Place Maker exhibition? Part of this project is to involve as many people as possible sharing their encounters with and responses to a particular piece of street art or street message. In the closing of this project on Tuesday the 20th of October, there will be both a screening and an exhibition. This exhibition will be in part interactive, recreating the map used during the project with images taken during the walks, as well as image submissions by others. This will involve using post its and getting people to respond to the images they see on the wall, with the piece receiving the most comments to win a book on the night. 1. Tell me who you are! 2. What made you stop and take this picture? 3. Did it trigger some kind of new awareness for your surrounding or your lifestyle? 4. 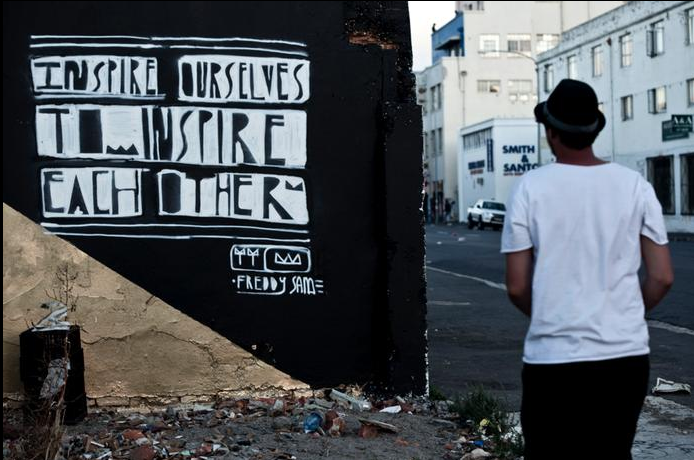 Do you think that street art/street messages can be a force for social change?